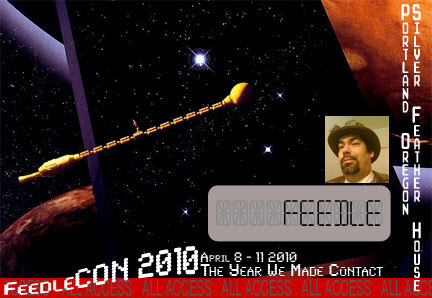 FeedleCON 2010: The Year We Made Contact | NO PANTS? NO PROBLEM. UPDATE: Follow @feedlecon on Twitter for day-of-event updates! It’s about that time, hey chaps? Confirmed scheduled for April 9-11, 2010. Book your flights! 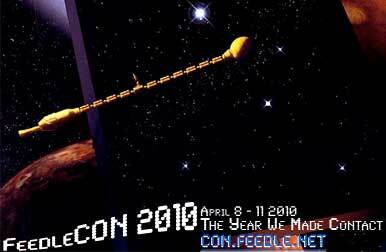 FeedleCON is a three day collection of activities with the intent of celebrating my birthday (which is April 10th). Think of it as a three-day-long party. Or, three single-day long parties targeting different groups of friends. Come one day, come one hour, come all three days. Like previous years, we’re cramming an awful lot in three days. Unlike previous years, there’s going to be some cost involved in activities. I’ve tried to clump them all on Saturday, so Sunday can be kind-of the “free day” so there’s plenty of time for those who might not have the financial means to run around town blowing cash. All of the event sites should be transit-accessible. None of these ideas are necessarily set in stone: feel free to comment if there’s something you’d think might be fun, and it will get consideration. In the morning, I plan on playing ham radio. I want to put up a new 2 meter antenna exclusively for APRS work. If you have any interest in ham radio, stop by early in the day and watch the fireworks! 2:00p – A suggestion has been made for an early afternoon hangout and board gaming session, for those who don’t do the whole video games thing. I think it’s a great idea. Tentatively scheduled for 2:00pm, but check the @feedlecon Twitter account for day-of-event updates. Friday is a LAN PARTY! Starting at 5:00pm, we’ll be playing HALO 2 and other local network games until our fingers fall off! Bring an XBOX, XBOX360, or Windows PC capable of playing HALO! We’ll probably also break out Gutar Hero and whatnot, as well… We’ll also be BBQing meat. Lots of meat. And, meat substitutes for the vegetarians. 8:00a Breakfast. Planned trip to Denny’s (yes, Denny’s), so I can get my free Slam. @ Jantzen Beach Denny’s, off I-5 at the Jantzen Beach exit. The #6 bus stops near here. 3:00p: Chinese Garden Tea @ Lan Su Chinese Garden. 5:00p: Dinner @ Todai, Pioneer Place Mall, downtown Portland. All you can eat sushi and pan-Asian: $27.95. 8:00p: BOX KARAOKE @ Voicebox, 2112 NW Hoyt St. $7 per person per hour, plan for two hours, plus beverages and snacks if you want them. 8:00p: An un-official wake for our dearly departed friend Jiji. I hate to end FeedleCON on a potentially “down” note, but the only way we can move on is to acknowledge the life we knew. All are welcome, friends of hers or not. Kells Pub, downtown Portland. PLEASE give me an idea of what events you plan on coming to, either here or over at my Facebook page for FeedleCON. We’ll need to know (especially for the box karaoke event) who’s coming so we can plan. I’m going to be making a limited number of custom badges. They look like this. If you want one, I’ve written a script to create one automatically. It will be added to the print run late Thursday afternoon, so if you mail it sometime before 2:00pm Thursday you’ll have a nifty custom badge! The photo should be a square JPG file. Think LiveJournal icon, but preferably 300×300 resolution or higher. The system will not crop, only scale to get it to fit inside the window. Send an E-mail to con@feedle.net, subject line should be “2010 Badge”. The first line will be the name printed on the badge: no more than 10 characters. No, you don’t get to pick the font. No, you can’t have more than 10 characters. Dammit, it’s my party, and I’ll cry if I want to. Those of you who don’t play the custom badge game will be stuck writing your name in the little window with Sharpie. No extra points if you make it look like the LED text. Wish I could make it. Happens to be weekend other girl from work is going to be in Portland, so will probably have to work extra hours. Sorry to miss such a momentous occasion. Voicebox sounds like fun. Should I check with you beforehand to make sure it’s still on? And I may be able to come to some of the Sunday events, too. I should see you for most of Saturday and Sunday events. If my plane takes off.